Many ecommerce players in Europe started selling their products or services online, but now also sell to consumers in physical stores, via an app or even a popup store. And it’s also the other way around: offline retailers now selling online as well. 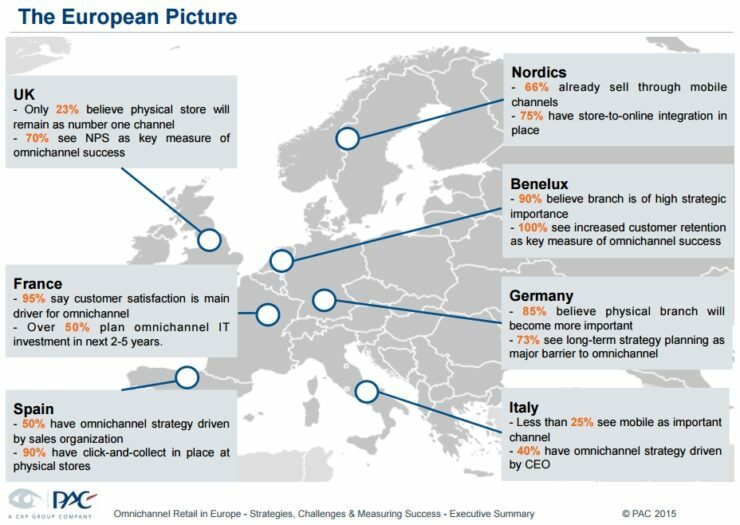 Omnichannel is gaining traction and this page gives an overview of omnichannel retail in Europe. Omnichannel is actually seen as a successor of multichannel retail. In this business model, retailers sell their products or services in different channels, but these channels were still very much separated. The website had a total different look and feel from the physical store and for example, if someone had ordered something online, the shop assistant wouldn’t even know. With omnichannel, the boundaries between those sales channels have slowly vanished, meaning there’s more interaction between channels and as a result, consumers get a better, more personalized shopping experience and retailers get to know more about their customers, which can increase their revenue. A report from 2015 showed that European countries approach omnichannel differently. According to the researchers some of it has to do with technology, some of it with infrastructure and some of it with the country’s culture. In Germany for example, retailers are familiar with omnichannel retail, with big players like Zalando, Amazon and eBay offering their products via different channels. Especially Zalando has shown some great examples of omnichannel retail in its home country and across Europe. It has launched several shopping apps, it has opened popup stores, it lets customers having their returns picked up at home and is partnering with multiple companies so it can gain more knowledge about its customers. This survey also shows that all participating retailers sell through more than one channel and 54% sell through three or more channels. Mobile channels are especially adopted by retailers in the Nordics (66%) and in the UK (60%). In this regions, social media is also a popular sales channel (60% and 43% respectively). If you want to read more about omnichannel retail in Europe, you should check out our omnichannel retail category, which lists all the articles we’ve written about this topic.